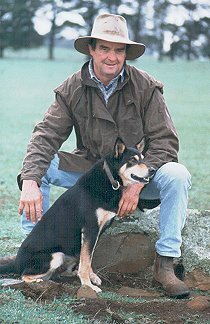 The Coogee Kelpie Stud was founded about 25 years ago. The Stud is based on Horton & Barambogie Mack bloodlines. Horton dogs are big casting with balance and cover as well as good temperament. Kelpies on the Barambogie Mack lines are strong, fearless calm types with a nice amount of eye. By crossing these bloodlines, one compliments the other producing excellent allrounder Kelpies, which dominate in the 'Coogee Stud' and also in other major Studs in NSW and also throughout the trial scene. I currently manage three properties in the Goulburn area and have always handled large numbers of stock in hilly country. I have always strived for excellence in my Kelpies. For a hobby, I do Sheepdog Trials and have been successful in the Utility, Yard and 3 Sheep trials. I have won four National Kelpie Trials (Utility) which is currently more than any other handler. I have also won four State and two Australian Yard Trial Championships and also captained three interstate Challenge Yard Trials to victory. Twice winning the Henty Gold for top dog of trial.